Happy Friday friends! 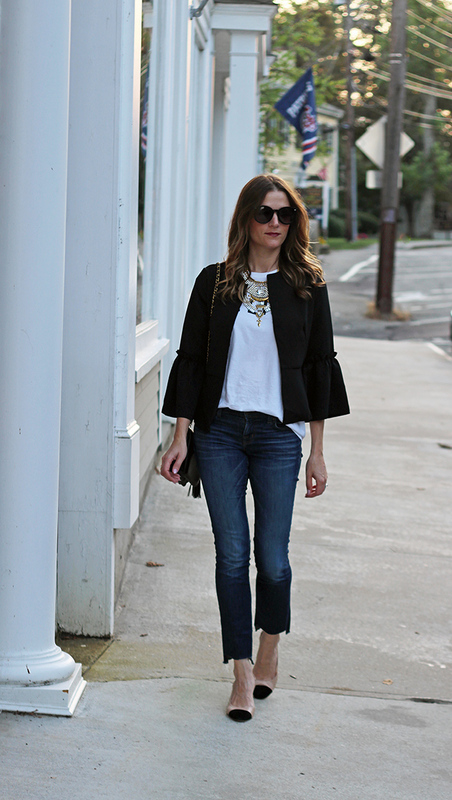 Remember last week when I styled these step hem jeans on the blog? Well, I'm back wearing them again, and this time I'm giving you the (super easy) tutorial of how to make them! But first, lets talk about this look because it's one of my favorites! If I had to choose one outfit to wear for the rest of my life, this would be it. 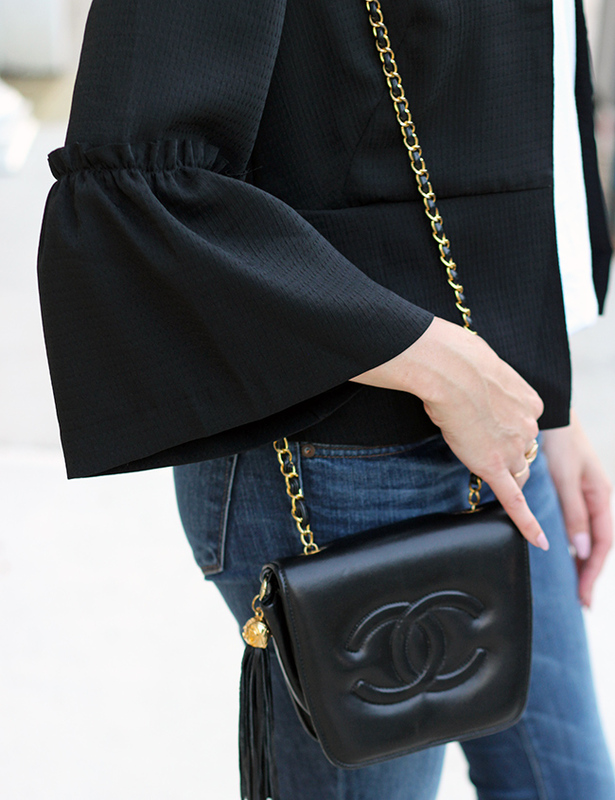 As much as I love adding trendy, must have, pieces to my wardrobe (hello, off-the-shoulder anything), there is nothing that I truly l love more than a classics button down shirt with a great pair of jeans. 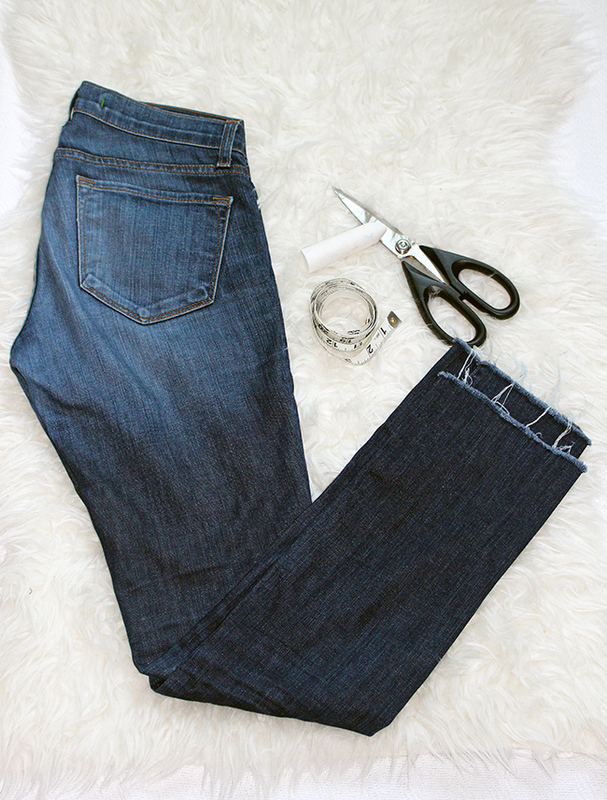 I always like to add a little edge to my look, so if my jeans are distressed, or have an undone hem, it's even better! Being a stay at home mom, I don't wear button downs often, because I know they're going to get dirty. The last thing that I need is to spend thousands of dollars in dry cleaning bills. However, when I discovered Ministry of Supply, it opened a whole new door! The brand makes clothing that is this made for the everyday, busy woman. All their items are machine washable (yes!) and wrinkle resistant. I love that I can wear a high quality blouse, and not worry about hummus being thrown all over it #momlife. I finished my look with neutral pumps, aviators, and an old Dior bag that I also DIYed into a cross body. PS. Have you taken advantage of the Shopbop sale yet? Today is the last day, so if there is anything you've been eyeing, make sure to get it! You can view my top sale picks here. 2. 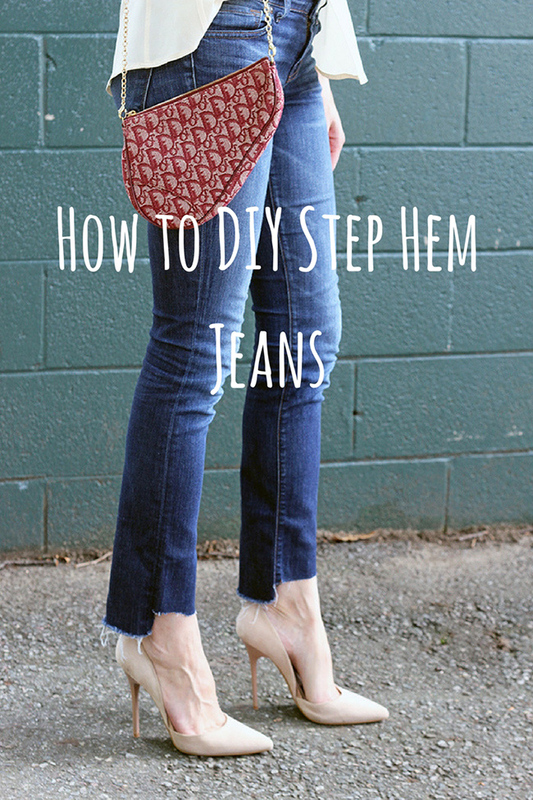 Determine where you want the hem of your jeans to hit. For this look, I suggest the ankle. 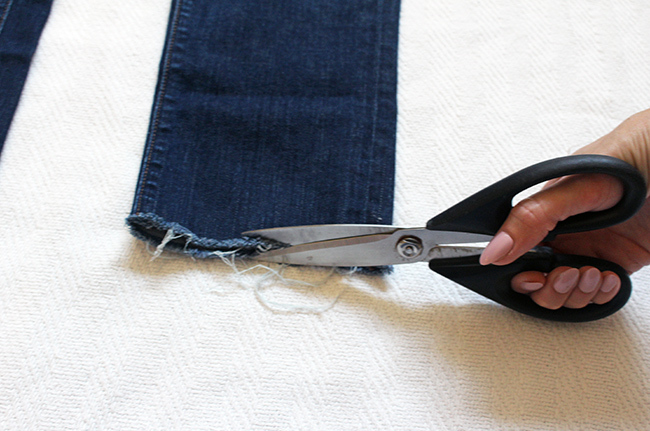 Remember that front will be shorter, so mark (with the chalk) where you want the back hem to fall, then cut the jeans to that length. 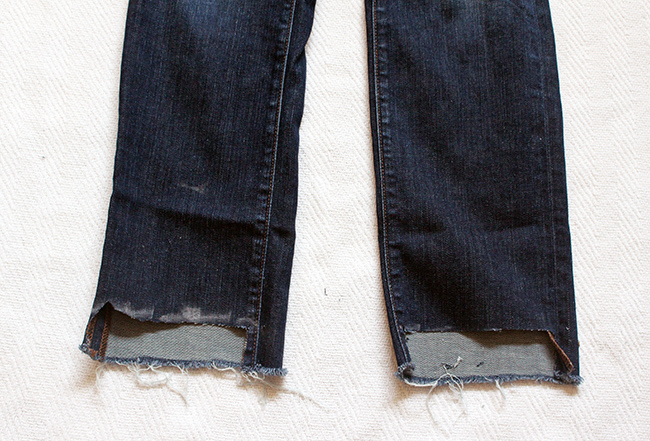 Note: I had cut this pair of jeans to make them ankle length in the past, so this step was already done on my pair. 3. Now its time to make the step hem! Although you can make a step hem as dramatic as you would like, I suggest a hem that is 1 1/2 inches shorter in the front than the back. Take your measuring tape/ruler and mark your jeans with the chalk where you want the front to fall (I did 1 1/2 inches). 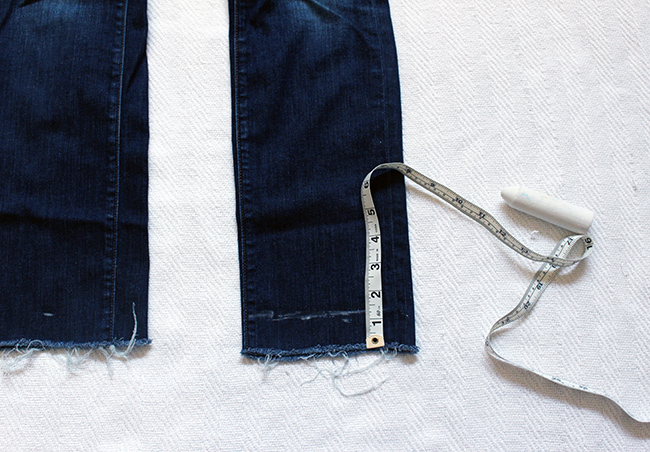 I drew a line across the entire front of the jean, so I would have a guide to follow while cutting. 4. Now it's time to cut! You're going to do it in a U shaped form. 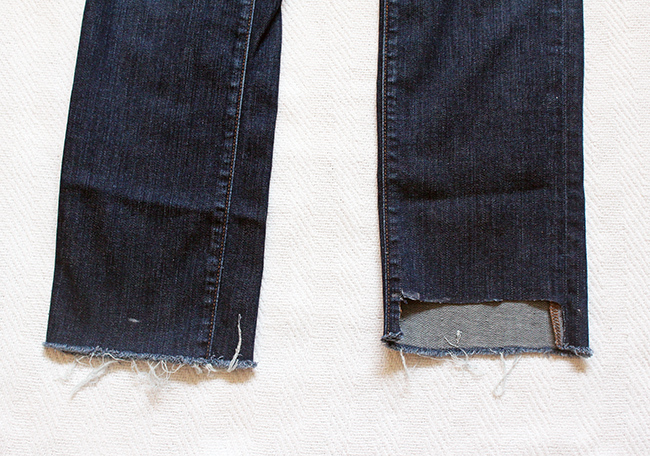 Start by cutting up along the left seam, then cut across the front of the jean along your chalk mark. Your going to finish by cutting down the right seam. Repeat on the other leg. 5. Voila! You now have step hem jeans! The best part about this DIY is that it doesn't have to be perfect. I like when my hem is slightly uneven and undone, and the more you wash them, the more your hem will unravel and fringe. The feature blogger is Alison of Get Your Pretty On. 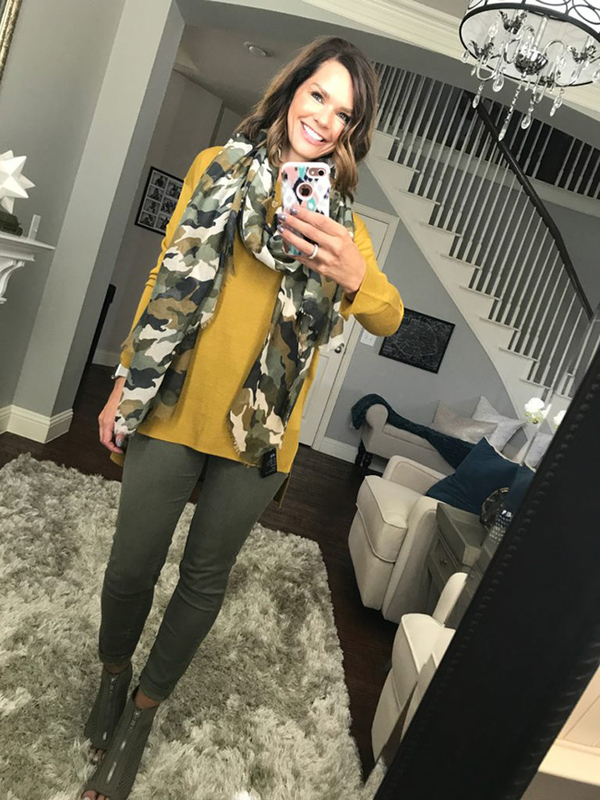 I'm loving this fall look, and how fun is her camo scarf! Make sure to stop by her blog to say hello, and see her simple tips for changing up your look when sticking to a capsule collection. 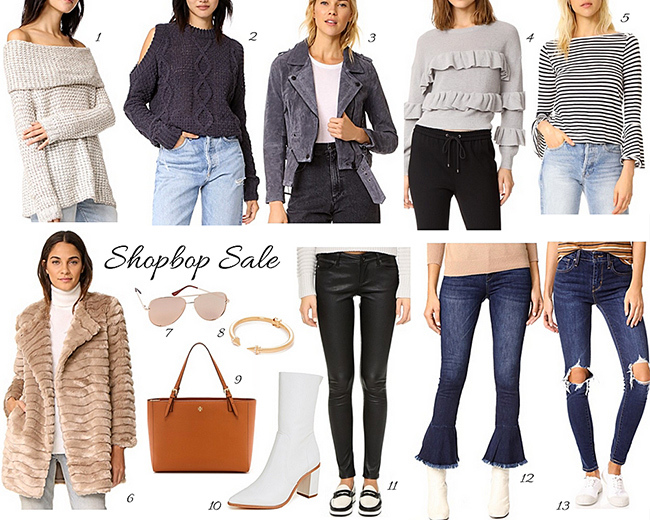 If you haven't began to stock your wardrobe with all the fall and winter pieces you need, then now is the time, as Shopbop is having their Event of the Season Sale! This is one of my favorite sales, as you are able to get new (and sale) merchandise at discounted prices. Most everything is included, so if you've been thinking about adding these classic Stuart Weitzman boots to your wardrobe, or investing in a great winter jacket, then now is the time! There is so much on my wish list, and many of the items that I wear on a daily basis are included. These Levi's jeans are my current go-to pair, and I love them so much, I'm thinking of getting them in the darker wash too. Also, you know how much I rave about these black high rise distressed jeans, and highly recommend this pair. I added this tote to my wardrobe a year ago, and it's been the perfect everyday bag. It easily fits everything that I need during the day, plus all of my items that I need to lug around for my kids. My favorite aviator sunglasses, and the gold bracelets that I wear daily are also included! 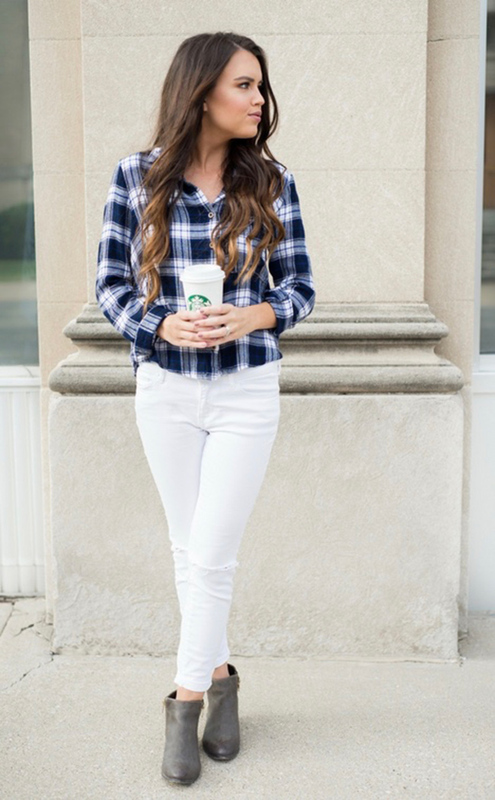 Currently on my wish list are these ruffle hem jeans, (are they not the cutest? ), this off-the-shoulder sweater, and I'm obsessing over these red booties. Both red and white boots are a must have this fall, and I love the 70's vibe that they add to a look. Her are the details: get 20% your purchase when you spend up to $500, then 25% when you spend over $500. Use the code EOTS17 at checkout. The sale runs for only three days, and ends Friday, so hurry! I linked my top picks for each category below. Also, if you do shop the sale, I'd love to hear what you get, so let me know in the comments. Happy Shopping! Happy first day of autumn! I can't believe the official first day of the season is here. I'm thinking that I should celebrate with a pumpkin spiced latte. Although, if I'm being completely honest, they're not my first choice of drink (I know, blogger shame). This time of year is my absolute favorite. I love when its cool enough to wrap myself up in a cozy sweater, yet warm enough that I don't need a coat. 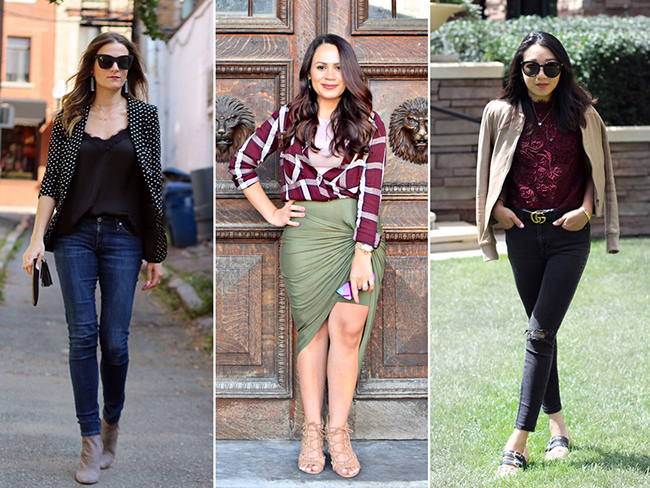 One of my favorite items to wear in the fall, in addition to a cozy knits, is a blazer. You may remember last Friday's post where I shared a my obsession for blazers. Well, I wasn't lying when I said that I can't stop adding them to my wardrobe, and my newest addition is this bell sleeved beauty. It's so simple, yet so stylish, and I love that it looks good with everything from jeans to dresses. For this look, I decided to show you how a blazer can easy dress up a casual outfit. I wore this exact outfit (minus the blazer) to the zoo this past Sunday, except I had on sneakers. After the zoo, we wanted to grab dinner, so I switched out my sneakers for these block heels, and threw on my blazer. It instantly took my look from basic to polished. To take it up an extra notch, I finished my look with a statement necklace. 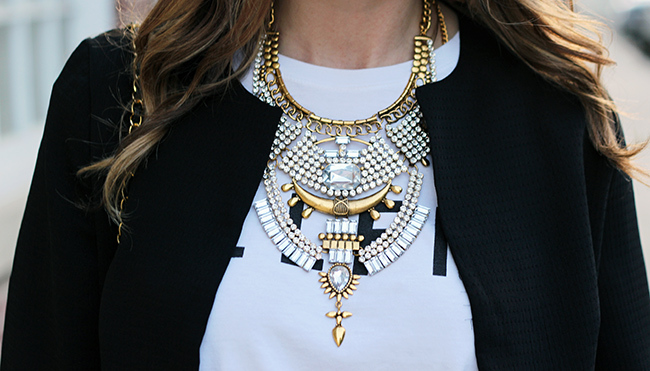 There is just something about pairing a statement necklace with a graphic tee that I just love. Now lets talk about these jeans. I've been loving the step hem trend, but instead of buying another pair of jeans, I decided to make my own! This is an old pair of JBrand that were just sitting in my closet. They hadn't been worn in a while because I wasn't loving the straight let cut. 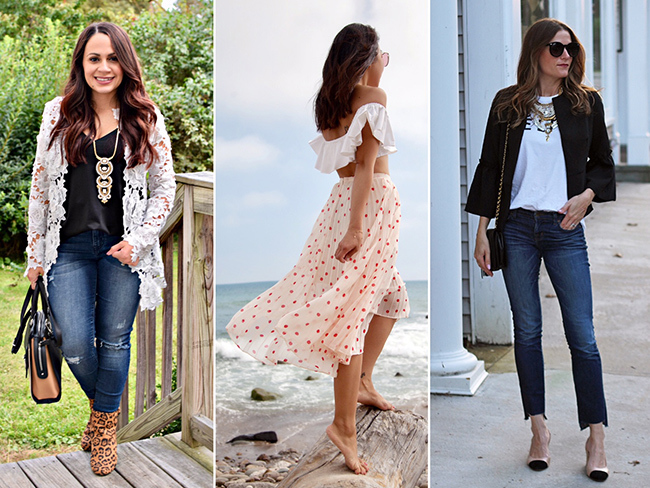 However, when I started shopping for step hem jeans, I realized that the pairs I loved the most were straight legged, and not skinny, and that's when I got the idea that I could make my own using the jeans I had just sitting in my closet. The best part about this DIY, is the messier the better, so there is no need to worry about having an uneven hem. I documented the process of turning these into step hem bottoms, so I'll be sharing the tutorial soon. If you aren't a DIY person, I did find an identical pair, also by JBrand, that I linked below, along with some other great options. The feature blogger is Adri of Adri Lately. Is her denim skirt not the cutest? I love it paired with the stripe shirt. 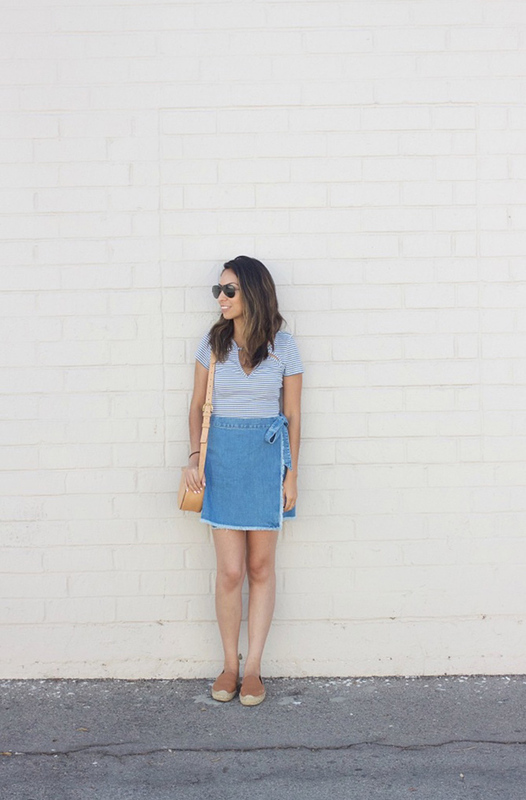 I also love her easy California style, so make sure to stop by her blog and say hello. The temperatures are starting to cool off here in New England, which means it's time to break out the sweater and boots! Although I'm sad to see the warm weather disappear, I have to admit that cozy knits and boots are my favorite things to wear, so I'm excited to pull mine out. 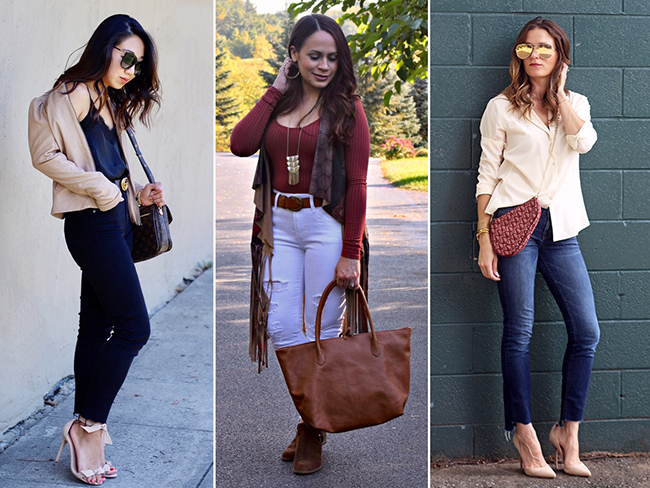 One trend that I'm absolutely LOVING this fall, is the slouchy boot. The slouch adds an instant cool girl vibe to both short and tall styles, and I can't wait to pair them everything from leggings to dresses. Now, I just have to decide on which pair to get! I'm loving the red color of this Steve Madden pair. Red is also a big trend for shoes this season, and I love how the bold color adds a fun statement to an outfit. If you're not into the red, they're also available in a pretty grey. If you're looking for a good splurge, I highly suggest this Stuart Weitzman pair. They have the perfect amount of slouch, plus the block heel makes them a comfortable option. They're also available in a grey sparkle, which I am obsessed with!! I'm thinking that I one hundred percent need to get this pair from Asos. Not only are they are great price (and also come in black), but they have an Isabel Marant feel, which have been on my wish list for years. What's your favorite pair?